The talent level in college basketball is as high as it’s been in a while. Here are six of the best duos you’ll see this season. You could swap Cam Reddish in here and not lose much ground, if any. But Barrett and Williamson will likely be the first and second options for Duke this season. Each has a tantalizing skillset. Barrett is a lefty point forward who has an incredibly advanced offensive game. He’s 6-7, but handles and passes like a point guard and has a decent jumper to boot. Barrett is the kind of player who could average 20 points, five rebounds and five assists per night and make it look effortless. And then there’s Williamson, who is truly an unprecedented talent. That word gets thrown around too often; it’s warranted here. There’s no track record of 285-pounders who have the athleticism Williamson does. A (perhaps) not-so-bold prediction: Williamson has multiple 20-20 outings (points and rebounds) this season. Barrett and Williamson still have some developing to do. Barrett’s jump shot is passable, but he’s not elite from 3-point distance. The same goes for Williamson, and conditioning may be a concern. But either of these guys can go for 30 points on a given night with high efficiency. Watch these two every chance you get. Heron was recently ruled eligible for this season, which is huge for St. John’s. Heron and Ponds form what’s arguably the most accomplished backcourt in America. We’ll start with Ponds, who lit up Duke for 33 points last season and averaged 21.6 points per game. He’s a pure scorer. At 6-1, 180 pounds, Ponds averaged that many points while only shooting 25.3 percent from 3-point range. Of course, you’d like to see that clip rise, but it shows Ponds is one of the most creative finishers in the sport. Attempting 5.8 free throws per game helps, and he’s essentially an offense unto himself. Ponds is a master in the pick-and-roll and has some of the best handles in college basketball. And now he has a backcourt sidekick in Heron, who averaged 16.4 points and 5.3 rebounds for Auburn last season. At 6-5, Heron can take on the tougher defensive assignments and attack scrambled closeouts thanks to Ponds’ penetration. 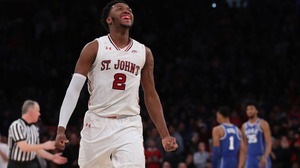 When Ponds rests, Heron can run the show and St. John’s will be in good shape. Not many teams have that luxury. Usually, when the primary shot creator sits, the offense dies. The Big East lost a lot of talent this offseason. The Red Storm could be poised for a jump in the standings. Yes, it was tempting to pair Cody and Caleb Martin, but Caroline was too good to ignore last season. He averaged 17.7 points, 8.6 rebounds and 2.2 assists. Caleb Martin averaged 18.9 points, 5.4 rebounds and 2.6 assists while making 40.3 percent of his 3s. Those are some eye-popping numbers, and what sticks out when watching Martin and Caroline is their offensive versatility. They can do everything: drive, shoot, post up, pass. That 2.2 assist average is no joke for a center; Nevada could run a lethal offense through Caroline in the high post if it wanted to. Sometimes, it does. But the Wolf Pack have so many options that it’s not a necessity. Guys like Martin are extremely hard to find in college basketball. Wings who can score from all three levels and defend multiple positions are incredibly valuable. Nevada has depth and star power. It’s going to be quite a year in Reno. The only senior-freshman combo on this list, Maye and Little’s games are completely different. But both should be awesome in 2018-19. We know what we’re getting with Maye: an all-around offensive force who can space North Carolina’s offense but also get the Tar Heels an interior bucket in a pinch. Maye averaged 16.9 points and 10.1 rebounds last year while making 43 percent of his 3s. He’s arguably the best offensive player in the ACC. Maye’s defense leaves some to be desired, but he’s fine on that end; North Carolina actually took off when Roy Williams gave him more center minutes last season. Then you have Little, who could be the best defensive player in the league from the jump. He’s a hyper-athletic wing with a 7-2 wingspan. Anyone else excited for those Little-Barrett matchups? As if Duke-North Carolina didn’t bring enough intrigue already. Joel Berry had a legendary career at North Carolina, but Little is a talent upgrade as Maye’s running mate. The Tar Heels are legitimate national championship contenders. Perhaps the best compliment you can give the Volunteers: they’re no fun to play against. Schofield and Williams set the tone in that regard. These guys overpower opponents. Both are around 240 pounds of solid muscle, have long arms, and have a bunch of skill. MORE: How can Virginia become more versatile? They combined to average 29.1 points and 12.4 rebounds for Tennessee last year. At first glance, their games appear to be redundant; they’re undersized centers or big power forwards (depending on your perspective) who operate inside-out. But they make it work, and defensively, they’re absolutely terrorizing. Williams and Schofield are stout, long, smart and try hard; that’s going to take you a long way on the defensive end. Tennessee ranked sixth in the country in defensive efficiency, and these are two of the biggest reasons why. This is the best defensive pairing on this list, and while they aren’t going to be winning any scoring titles, they’re solid on the offensive end. What a duo. Neither or these guys cracked 27 minutes per game last year, but they were outstanding in the time they played, each averaging double digits in scoring. Hachimura is perhaps the most dangerous combination of size and athleticism in the country outside of Williamson. At 6-8, 225 pounds, Hachimura is a blur with the ball in his hands; there might not be a scarier player in transition. He’s raw (he shot less than 20 percent from 3-point range) but he has good shooting mechanics and improved immensely from his freshman to sophomore year. It wouldn’t be surprising to see Hachimura average something like 15 points and eight rebounds with elite defense. Then you have Tillie, whose game is just… beautiful. That’s really the only way to put it. A 6-10 big man, Tillie made a blistering 48 percent of his 3s and averaged 12.9 points per game in his first year starting. Tillie is arguably the best shooting big man in the country, but he can do a little bit of everything else: he’s a mobile, smart defender who can pass at the elbows. Gonzaga is going to win a ton of games, as usual, but we’ll see how far it can advance in the NCAA tournament. These two will dictate the Bulldogs’ destiny.